The use of low-level electrical stimulation for pain relief is not a new treatment. It has been used for years by athletic trainers, chiropractors, and physical therapists to relieve pain from injuries and chronic muscle and skeletal discomfort. Those treatments are administered in an office using large machines. 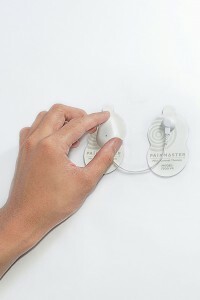 The Painmaster patches look like the electrodes used in a doctor’s office for administering electrocardiograms. They are applied and removed just as effortlessly.